After almost of year of debating + researching we finally purchased an organic king mattress. We searched high and low for one that fit our requirements without breaking the bank, and finally decided on an Avocado Mattress. We looked through many of the most popular brands and compared them based on whether or not they were: organic, zero VOC, sustainably sources, chemical-free, made in the USA and affordable. Here are the other brands we researched and how they compared to Avocado. Note: the prices are based on king size mattresses. We obviously chose Avocado and are over the moon happy with our mattress! It is comfortable, firm and supportive but soft, safe for our family, and we are supporting a small USA-based business. To say we are happy is an understatement. The edges are supportive, so you don't feel like you are sinking in when you sit on the side of the bed, and I have been sleeping much better than I was on our previous mattress. I don't have to worry about our kids breathing in toxic chemicals from the off-gasing of plastic that occurs in other mattresses. We have enough room for everyone when the littlest sneaks into our bed in the middle of the night. The only problem is that I don't want to get out of bed! If you follow on Instagram, you've seen that our bedroom is fairly monochromatic but full of pattern and texture. It's my favorite room in the house and one I often visit because it feels so serene. To complete our new bed, I ordered some organic flannel sheets for winter (similar here) + crisp white cotton ones for spring. I went with a black bedskirt to hide the metal frame (and storage underneath! ), and we already had a king size comforter (also love this one, this one and the simplicity of this one). I just added a coverlet for more texture and extra warmth and will simply fold the comforter at the food of the bed when the weather warms up again. Add a couple king size pillows for extra coziness, black and white pillow cases (similar here), and an amazing throw (similar here and here) and our bed was complete! My bedroom has become my oasis, and I truly look forward to climbing into bed at night! Ever since we moved into our home over five years ago I've been wanting to pain our oak trim white. It's one of those projects that no one really wants to tackle because it's just so huge, yet it would make such a dramatic difference in the look of our home. Well, a couple weeks ago I finally got my wish! We ended up hiring someone to do the work because #life, and I could not be happier. We also painted the built-in bookshelves in our living room which as really opened up the whole space. The windows are another source of debate... black slats or full pane? We have full pane windows in our master, and they let in so much more light! But again, I love the contrast of the black and white. I'll definitely be mixing it up with our front door, and will most likely go with something more green like the top image. The exterior of our door is currently grey, so a little bit of color will help spruce up both the front porch and the entryway which now contains a vintage piano (that will shortly be painted white, ha!). More updates this summer! I remember our gardens growing up... the smell of the dirt, the watering of the plants, the pulling of the radishes and beets. I remember my mom giving me a tiny pair of gloves and showing me how to place the plants in the ground. Those times in the garden with her are some of my sweetest memories. I feel at ease in the garden, and there is a sense of simplicity to the tasks that make even the most complicated things seem simpler. But I would argue that there's something about gardening that appeals to most everyone, even if we don't really have a green thumb. + Stress relief: In a world where we are constantly pulled in a million directions with something always demanding our attention, the sights, smells, and sounds of the garden can promote relaxation and reduce stress. Our brains have a finite capacity for attention directed at cell phones, computers, etc. and when that capacity gets used up we tend to become irritable, error-prone, distractible, and stressed out. Luckily this fatigue appears to be reversible! We can replenish ourselves by engaging in "involuntary attention," an effortless form of attention that we use when enjoying nature. + Improves depression symptoms: similar to the stress relief, time in nature allows our brains to disconnect from all the distractions, stress and screens trying to grab our attention and focus us on something tangible. I also believe it connects us back to creation, which brings us to a grounded place emotionally and naturally improves our mood. + It can be exercise: The days after we plant our garden are some of my sorest days! Hamstrings, triceps, biceps, abs oh my! It's because digging, planting, weeding, and other repetitive tasks that require strength or stretching are excellent forms of low-impact exercise! + It's good for your brain! Some research suggests that the physical activity associated with gardening can help lower the risk of developing dementia. + Good nutrition is good for mind, body and soul! The vegetables, herbs and fruit grown in your backyard are ideally organic and are super fresh, so the nutrients, minerals and enzymes are still active. Feeding your body the best is good for you physically, mentally, and emotionally! Be outside, grow your own food, connect to nature, relieve stress and anxiety, boost immunity and brain health and improve mood all at the same time? Sign me up. Honestly it sounds like a commercial for the perfect pharmaceutical medication, except with gardening there are no disclaimers or side effects. Just some good old fashioned dirt under your fingernails. When we found out we were pregnant with Elliot one of the first things we did was switch out our Clorox Cleanup for a green cleaner. We had already switched out our soaps and shampoos to "green" options (read: popular brands that we thought were chemical-free but were really just synthetics based on plant components...), but we realized that we needed to start creating a truly chemical-free home. I knew that I didn't want our babe to be exposed to harsh chemicals... on his clothes, in the air. We also learned that our plug in air fresheners were laced with formaldehyde which totally blew me away and made me even more passionate to find healthy alternatives! I'm a researcher by nature so you know I scoured the internet for other options, DIYs and the best of the best for what we should use. Fast forward three years later and we have achieved our goal. Zero chemicals, all plants, and a super clean home and great smelling home all at the same time. We use plant-based cleaners to clean the whole house, including the sink after we prepare food and meats. And yes it gets it super clean!! Added bonus is that our cleaning supplies are delivered directly to my door and I get $75 back every month to spend on whatever I want. (Insert praise hands emoji!) I love me some Target, but they've never given me $75 just for buying stuff I use every day anyway. And my house smells like a chai latte instead of harsh chemicals and bleach! #winning. Here are some of our chemical-free cleaning favorites! + Thieves Household Cleaner: We use this for the ENTIRE house! Counters, floors, bathrooms, stovetop, showers, commodes, literally everything. This is super affordable because you use 1 capful per 16oz spray bottle for the majority of cleaning. If we really need a heavy degreaser we use 2 capfuls. + DIY Counter Cleaner: Sometimes I also use a DIY version with Thieves essential oil, Lemon essential oil and a little bit of castille soap on our glass cooktop when it gets sticky! + DIY Mirror Cleaner: Combine 1 capful Thieves Household Cleaner, 5 drops Citrus Fresh essential oil blend, 1 tsp white vinegar, and 3 cups water in a glass spray bottle. + Thieves Dish Soap and Dishwasher Powder: I also mix a bit of the dish soap with a little of the Thieves cleaner and water in a roller ball to spot treat stains on our clothes (helloooo little ones starting solids)! + Thieves Laundry soap: This super concentrated laundry soap is my favorite! It gets our clothes super clean without chemical surfactants and artificial scents, and it is safe for HE washers! You only need 1/4 capful, so it lasts forever. Added bonus is that it is safe for cloth diapers! + Wool dryer balls: We use these instead of dryer sheets and add essential oils to make our clothes and linens smell great! They help cut the static (use more dryer balls for loads with lots of fleece or static-prone fabrics) without adding crazy chemicals to your clothes. Peppermint, lavender, and eucalyptus are some of my favorites to add to the dryer balls. So basically we clean our whole house with Thieves essential oil, ha! The Thieves oil is a really amazing blend of oils named after a band of thieves who robbed plague victims during the Black Plague. They were perfumers by trade and were forced to reveal their 'secrets' when apprehended. The Thieves blend contains cinnamon, clove, lemon, eucalyptus and rosemary oils that smells amazing and cleans all the things! Plus, it is Gwyneth Paltrow recommended ;) We love to diffuse it with orange and black spruce or balsam fir, with orange and RC for respiratory support (great for after school! ), with lemon and peppermint for a fresh and clean home. Click here to find out more about why we love essential oils and to start creating a chemical-free home of your own! I love to find unique pieces at antique stores, thrift stores and even barn sales, so when I saw this beat up old coop outside of an auction, I knew it was going to live on our wall. We took it home and cleaned it up with some soap and water, but didn't do much with it in the way of decorating for over four years. (The coop was actually one of the first pieces I bout for our house!!) When we finally took the time to finish the project, we simply sawed off the perches and cut wooden shelves to fit each nesting box. My husband hammered the shelves in with a rubber mallet, then we attached a thick piece of wire to the back for hanging. We have it hanging on two large nails in studs in our dining room because of the weight and have never had any problems! I recently added a 'Pharmacie' sign above it that my sister gifted me for Christmas. I use the coop as storage for my oils since my office nook is in our dining room, and it's accessible with the flow of our daily life. (Having your oils out somewhere visible will ensure that you use them!) As we continue our dining room update I will probably mix in some other elements like our glasses for entertaining, a mix of modern and vintage vases (love these, these, and this) and other fun elements. Next up is a new light fixture and maybe some hardwood floors!!! Ahhhh Saturday! We are spending the weekend working around our house, making merry and doing a little bathroom renovation. The shower is framed with a lovely 6-foot wall built, and today it will be covered in subway tile! Our next goal is to pick out a paint color for the walls and start production on the barnwood vanity. Currently loving: these cozy Minnetonka boots (similar here and here), plaid scarves, and peppermint bulletproof lattes in a mason jar. We are also spending some time adding some holiday cheer to the house as we prepare for a fun gathering for my oils team this week. I can't wait to see all the happy, smiling faces, make roller bottles (LOVE these colorful ones! So great for gift giving and parties!) and munch on my new favorite pumpkin bread. I am beyond thankful for Golden Drop Society, and I truly enjoy sharing that love! I also recently created a Winter Wellness e-magazing that I'm sending new members. Would love to send one your way! Happy Saturday friends! Confession: I have a slight tendency to over-collect glass bottles and jars. It is partially due to the fact that we make all of our personal care products with essential oils and said oils need to be stored in glass containers. But it is also due to the fact that I can't help but repurpose the things, especially when the repurposing keeps us from having to purchase another item. I've been known to collect coconut oil jars baby food containers, rescue old beakers and graduates from yard sales, and even dig up old bottles in our backyard (true story). And while they all take an overnight soak in castille soap + water, more often than not, these repurpos-able items need a little more attention. Which brings me to my point: the glory of lemon essential oil. After cleaning with soap and water, I rub the jars down with lemon oil to remove any lingering grime and also to get rid of the sticky resident that labels leave behind. Win win. Add an extra win for repurposing, and you've made my day. So here's to filling old bottles with magic potions, resourceful salves, fresh herbs and even a pretty flower or two. After an unexpected water issue this past weekend, we have decided to go ahead with updating our master bathroom. Hashtag silver lining! Our home has a great layout but is very dated, so we have quite a bit to accomplish. Our style is modern farmhouse with minimal and natural elements, so we want to keep a minimal color palette, make the space incredibly functional, and also be able to do most of it ourselves. Here are some of our inspirations. We have already pulled up the carpet and are planning to start some of the work this weekend! More updates soon! Also, you can find all these images and more inspiration here. One of the things I most looked forward to with owning a home was the ability to have an in-ground vegetable and herb garden! I have such fond childhood memories of planting, watering, and harvesting our garden, and nothing beats fresh, organic (and free!) produce all summer long. That being said, if you don't have a large backyard or even a yard at all, gardening is by no means off limits to you! As a means of simplifying life and preventing the deer from feasting on our plants, we planted a mix of in-ground and container vegetables this year. Container gardening is feasible for anyone, even if all you have is a tiny fire escape or a windowsill! + Choose containers that suit your style, but make sure that there are holes in the bottom for drainage. Select deep containers for vegetables, and if you are growing on a window sill, make sure to place a plate or try beneath the containers to hold the draining water. We prefer cedar planters since they are natural, rot-resistant, and we love the smell of cedar.These are a great option. + Tomatoes, bell peppers, are a great place to start and do very well in containers! Also try potatoes, carrots, cucumbers, zucchini squash and yellow squash for summer. The type of vegetables and herbs is really up to you, and there are very few limits! 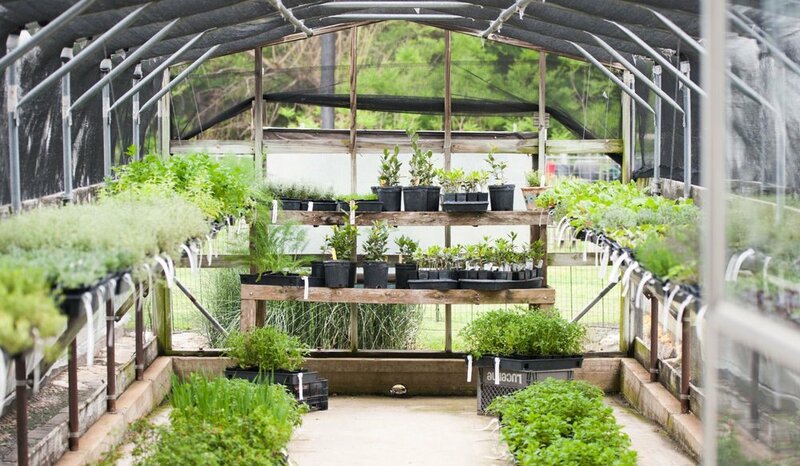 + Herbs can be grown just about anywhere, in any small or large container. Love these creative ideas for windowsill gardens! + Grow zucchini, cucumbers, lettuce and chard on a porch or deck, away from deer and other animals. + You can start your plants with seeds or you can plant them as pre-grown transplants. Seeds should be started indoors, well before being planted into your container. Growing from transplants is great if you are new to gardening or aren't able to start planting early. Transplants are already a few weeks old, so choose plants that look healthy. + Plant your vegetables and herbs with plenty of nutrient-rich potting soil, and water them daily! If the soil is moist to the touch, you can skip the watering, but check it daily. Also, make sure to water your plants until water comes through the bottom of the pot.